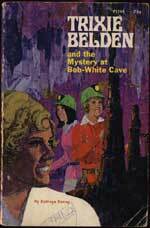 The ghost writer of this book is not known for certain, but it could possibly be Stack who lived in Missouri. 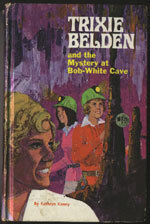 The Bob-Whites, minus Di and Dan, join Andrew Belden at his cabin in the Ozarks for a holiday. 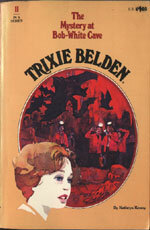 Trixie has them in all involved in an adventure from the moment she decides to hunt for the valuable ghost-fish. She is saved from the attack of a wild cat by a "ghost" and is almost drowned in an attempt to find the rare ghost fish, but their adventures lead them to reveal the identity of the ghost and bring a family back together. Slim Sanderson rubs the Bob-Whites the wrong way from the beginning and a string of incidents sees him quickly become the villain, although Mr Glendinning and Mr Moore are suspected at times. Mart is fifteen at the start of this book, so it must take place after June 1, but Di and Honey are also said to be fourteen. Have their birthdays already occurred? It doesn't seem so if you go by #14 when Di is celebrating her 14th birthday. Di is said to be in California and Dan is working. 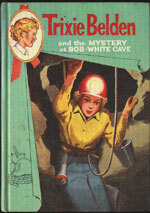 Apparently, there's a cave in Honey's father's woods. Bill Hawkins has his doubts about Slim, but Andrew Belden doesn't. The Happy Valley Mystery states what a good judge of character he is, but obviously not on this occasion. Mart and Brian have experience milking cows, but Jim doesn't (p. 65). In The Happy Valley Mystery Trixie says that she and Brian helped deliver a calf from their cow. Jim is able to play the harmonica, and pulled it out of is pocket to accompany Linnie's singing (p. 68). Brian is described as "their acknowledged leader" (p. 30) and the spokesperson of their group (p. 88). 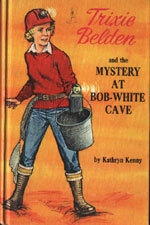 In the original book, Helen Belden writes that Uncle Mart is sick and Aunt Helen asks her to come and stay with her. However, in the oval paperback edition, the name is changed to Aunt Alicia. 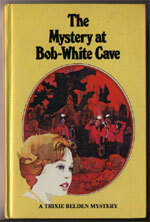 "With a great sigh, Trixie opened her eyes and looked into Jim's anxious blue eyes" up until the oval paperback edition where it was corrected and changed to green (p. 175). 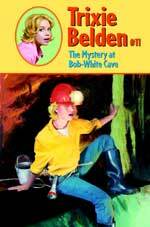 Suggestions for further reading on spelunking and caving only appeared in the first edition of this book.